All the Essential Oils I purchase are only what I use, and I must say I use a lot of them. They all have a purpose in my life and also in my organic skin care line at Urban Eco Beauty. I am going to share with you a few precious oils that many do not even know truly exist nor how to properly use. These oils are so powerful and unique that when you are building your own Essential Oil collection you will be thrilled to now be able to add these in too! Essential Oils have been used for thousands of years for their therapeutic and healing properties as part of the practice of Aromatherapy. They’re sourced from leaves, stems or roots of plants that are known for their health properties. Here are some of my ultimate favorite oils! For centuries, South Americans have used Copaiba resin (a tree resin) to promote the health of the respiratory, digestive, urinary, cardiovascular, and immune systems. Copaiba essential oil is calming, soothing, and supportive to the skin and nervous system. Recent research on caryophyllene suggests a number of other means by which Copaiba essential oil can support overall health. When taken internally: it can possess strong antioxidant properties; promote healthy cellular function; help support immune function while supporting overall circulatory health; help support the health of the gastrointestinal tract and colon; promote a healthy nervous system; help keep the mouth, teeth, and gums clean and healthy looking. Topically it can keep the skin clean and clear while helping to reduce the appearance of imperfections, support uterine health, protect against unwanted pathogens or bacteria, reduce puffiness, help with aches, soreness and discomfort, reduce liver tissue damage, protect against fungus and mold, and eases menstruation. Turmeric is a flowering herb related to ginger with fibrous roots and a savory flavor. Grown throughout Southeast Asia, turmeric is known worldwide as the spice that gives curry seasoning its color and distinctive flavor. The root is also used as a natural yellow dye. The rhizomes and tubers of this plant have been used in holistic Ayurveda health practices for their powerful benefits for nearly 4,000 years. Turmeric has also been used historically in China and Sri Lanka. Recent scientific attention on curcumin, a chemical constituent of turmeric root, has rekindled interest in turmeric oil’s health benefits. Curcumin is a powerful antioxidant, and Turmeric essential oil has been shown to help increase curcumin potency and absorption. Turmeric also contains the chemical components ar-Turmerone and Turmerone. These chemical constituents are known for their nervous system benefits. 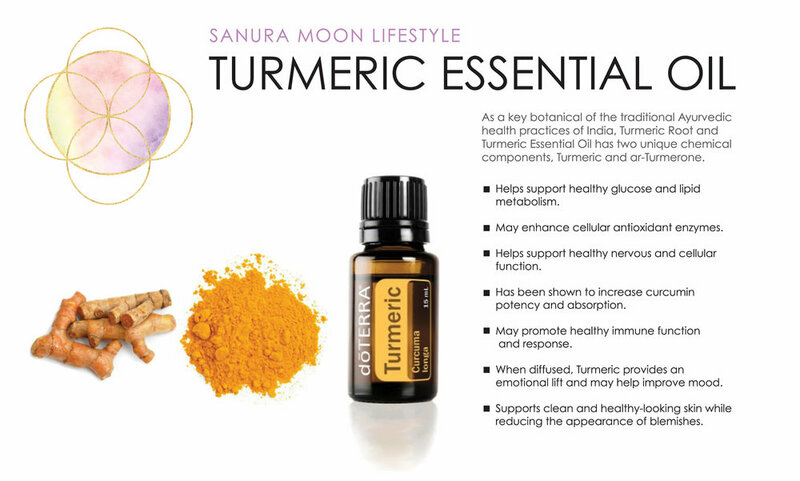 Turmeric is a powerful essential oil. When taken internally, it offers daily antioxidant support and helps support a healthy nervous system, cellular function, and immune response. It also helps support healthy glucose and lipid metabolism, and healthy circulation. When inhaled, Turmeric uplifts mood and emotions. Renowned as one of the most prized and precious essential oils known as the King Of Oils. Frankincense Essential Oil offers extraordinary health benefits. Its also one of the oldest recorded oils throughout all history. Frankincense Oil has the ability to strengthen skin and improve its tone, elasticity, defense mechanisms against bacteria or blemishes, and overall appearance. It may help tone and lift skin, reduce the appearance of scars and acne, and help heal wounds. It may also be beneficial for fading of stretch marks, and for healing dry or cracked skin. Melissa officinalis, also known as lemon balm, received the name “Melissa” because of its sweet, fresh, citrus-like fragrance, which was known to attract bees (Melissa is Greek for “honey bee”). As one of the rarest and most expensive oils, Melissa has a wide range of health benefits and uses. Melissa Oil is used as a flavor in teas and nice-cream as well as with some fish dishes. Because of its positive effect on mood, Melissa has long been used to calm feelings of tension and nervousness. Diffusing Melissa at night can help initiate a restful sleep environment and promote emotional well-being. Melissa may also help to support a healthy immune system. A few different health studies have been done on Melissa Oil and the Herpes Virus. DISCLAIMER: These products and statements have not been evaluated by the Food and Drug Administration (FDA) and are not intended to diagnose, treat, cure, or prevent any disease. All information is provided for educational purposes only.